The InsaneArcheryTM Camera Bow Mount was designed to provide unparalleled versatility. With a host of unique features, this mount excels were other have failed. By incorporating a simple yet flexible design, this product can be easily installed on almost ANY bow, including crossbows! It has a standard 1/4"-20 male mount and is compatible with anything that mounts on a standard tripod. Constructed of state-of-the-art materials, the InsaneArchery Camera Bow Mount is virtually indestructible! So how tough is it? It's been designed to take the punishment of the outdoors and years use. It'll definitely take a lickin and keep on clickin! Don't just take our word for it; watch this video and decide for yourself! The most important thing to any bowhunter is weight... and the lighter the better. All together this camera mounting solution weighs in at a mere 2.8 ounces. That weighs less than $3.50 in quarters! Incredibly, the box that the Camera Bow Mount ships in weighs MORE than the mount itself! This is accomplished by utilizing state-of-the-art materials that provide the ultimate strength and durability while maintaining its extremely light weight. 3. Captive Hardware Means Never Having to Look For Parts! The InsaneArchery Camera Bow Mount has incorporated 100% captive hardware which eliminates the need to use tools once it's attached to a bow. That means no loose screws, nuts or bolts that could fall off in the blind or tree stand. Dropping a small piece of hardware from your tree stand would definitely ruin your video experience. The result is an "all in one" unit that once mounted to the bow, is totally self contained regardless if the camera is mounted or not. You never need to hunt for a nut or wrench to attach the camera. Simply align the base screw with your camera's tripod mounting hole, normally located at the bottom of the camera, then hand-tighten using the large, easy to grip rosette knob. 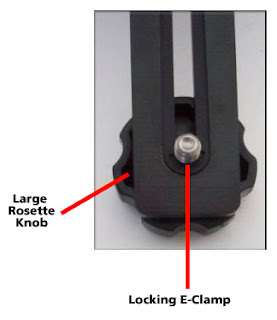 Locking e-clamp assures that the camera mount knob and tripod screw stay securely attached to the swing arm, regardless if there is a camera attached. Why should you have to buy a left-handed or right-handed mount? Why not have a camera bow mount that will work on either side of your bow? How about the ability to effortlessly and quietly move the mount from one side of the bow to the other without the use of tools? The InsaneArchery Camera Bow Mount answered all of these challenges and more with its Patent Pending, 180º range of motion swing arm! The camera mount swing arm can effortlessly be moved into one of 5 semi-locking positions, without ever being removed from your bow, making it one of the most versatile camera bow mounts on the market today! In order for a camera bow mount to be truly versatile it needs a supports multiple mounting options on your bow. Most mounts allow you to position the camera ONLY over the stabilizer. Or worse yet, they require you to totally replace your stabilizer! What if you're hunting from a ground blind... when you draw your bow, where is your stabilizer? That's right; it's BELOW the blinds shooting window. That means you miss the video completely. Because of the superior design of the InsaneArchery Camera Bow Mount you can position your camera anywhere on your bow. This unique capability allows for the mount to be used on virtually any bow and in any circumstance; tree stand, blind or even while stalking. Figure 1 and 2 shows how the mount can be attached directly over the stabilizer. This is probably the most common mounting location. However, Figure 3 and 4 demonstrates how the InsaneArchery Camera Bow Mount can be attached to your bow utilizing any of the cut-outs on the bow risers ; above or below, top or bottom of your bow - the choice is up to you. Figure 5 and 6 show how the mount can even be attached to the bows site - perfect for when hunting from a ground blind. Even when the mount is attached to either of these alternative locations, the camera mount swing arm can still be easily rotated forward to position the camera out of harm's way, then quietly back into position when the time is right. The InsaneArchery Camera Bow Mount can easily be attached to almost ANY crossbows on the market today. Because of its flexible design, the camera bow mount can be attached to the crossbow using any of the manufacturer cut-outs. Be sure to order the Crossbow Adapter and Hardware Kit. Another important feature is the ability to provide some camera protection while walking to or from a hunting blind or tree stand. When a camera is in a permanently fixed position on the side of the bow it can be easily scratched or damaged as you walk through the woods to your hunting location. It's equally awkward to have the camera protruding from the bow as your try to quietly stalk an animal. By using the swing arms locking mechanism, you can store the camera in the forward posit ion aligning it in the natural shape of the bow. For example, if you mount the camera above the stabilizer you can position the camera to be directly over the stabilizer and aligned in the same direction. This makes for a more natural fit and helps protect the camera when walking. When it is time to use the camera, it can easily and quietly be pulled back into the desired recording position. The design allows for the InsaneArchery Camera Bow Mount to fit in the travel case while still attached to your bow. The system can be permanently attached to your bow and does not need to be removed every time you pack the bow in a hard shell travel case. By moving the camera mount swing arm to the forward position (straight forward from the bow, directly above the stabilizer), the bow can be easily placed in the travel case without the camera mounting system being loosened or removed from the bow. As you can see below, the system can easily be used with a number of different sized cameras and camcorders. Things that have to be removed from your bow for travel have the potential to be left behind! Item Reviewed: Insane Archery's Camera Bow Mount 9 out of 10 based on 10 ratings. 9 user reviews.